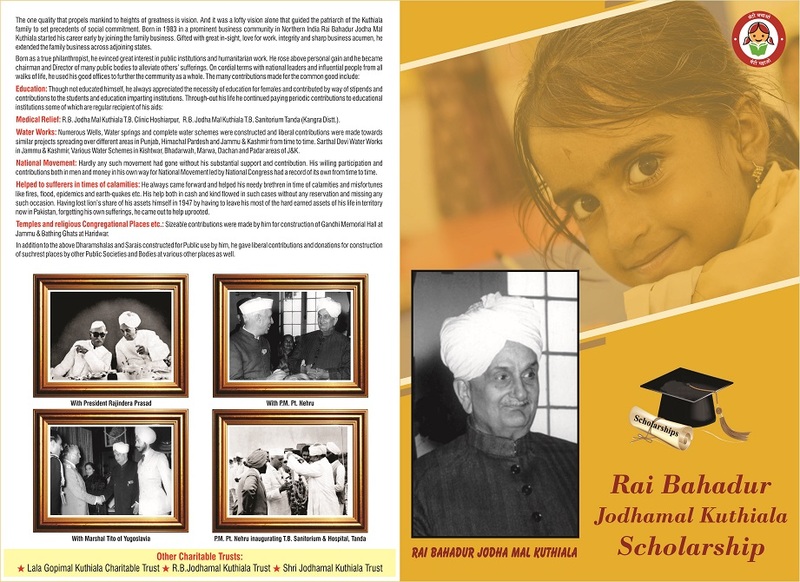 In the recently held function at Jodhamal School the Rai Bahadur Jodhamal Kuthiala scholarship for the year 2018 were distributed. The Chief Guest, Hon’ble advisor to Chief Minister, Prof. Amitabh Mattoo, the Guest of Honour, Secretary Education, Mr. Farooq Ahmed Shah, IAS, Director Education, Mr. Rakesh Srangal, KAS & Joint Director Education, Mr. Charandeep Singh, (KAS)along with the CEO Jammu, Mr. J K Sudan and CEO Samba, Mr. Ram Pal Bal attended the function. Programme started by invoking the Gods with a wonderful choreographed Krishan Leela by the junior students of Jodhamal School. Scholarship of Rs. 10,000 each were given to meritorious girls students studying in class 11th of Govt. 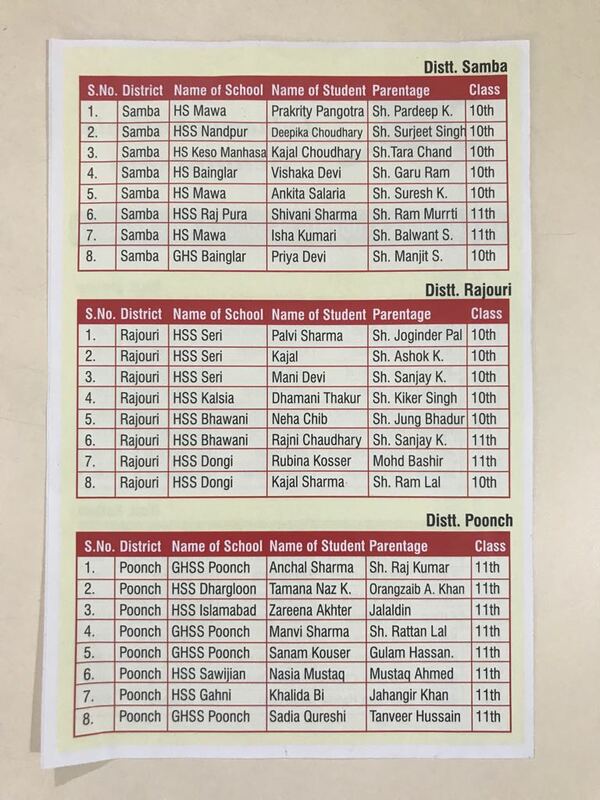 Schools of border areas of Jammu Province. 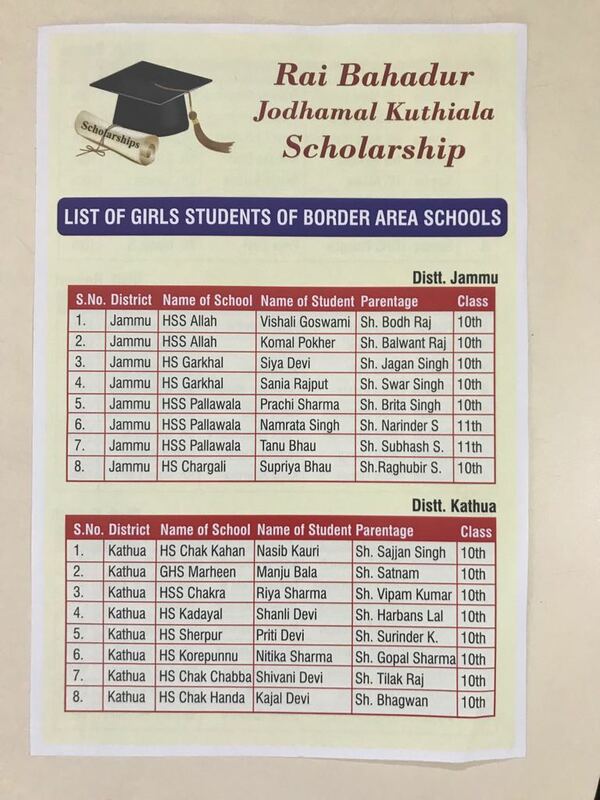 8 girls each from the border arear of Jammu, Samba, Poonch, Kathua&Rajouri districts were awarded the scholarship. Also Jodhamal School has adopted three Govt. schools namely Govt. High School, Deeli, Govt. Primary School, Sainik Colony, Jammu & Govt. Primary School, Prithvipur for the past few years. Students from these adopted schoolspresented street plays on BetiBachoBetiPadao&Kismattheme prepared by Jodhamal Teachers. 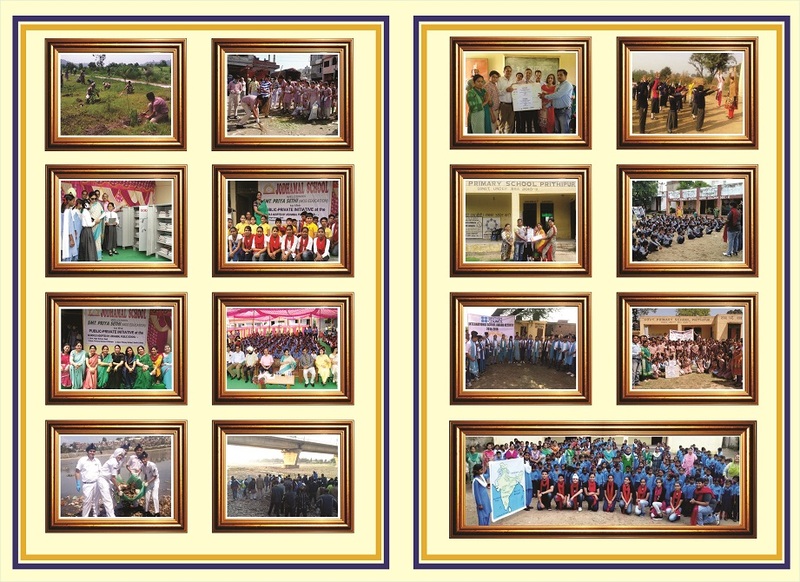 Jodhamal School also donated Class Libraries and furniture to all the three schools. 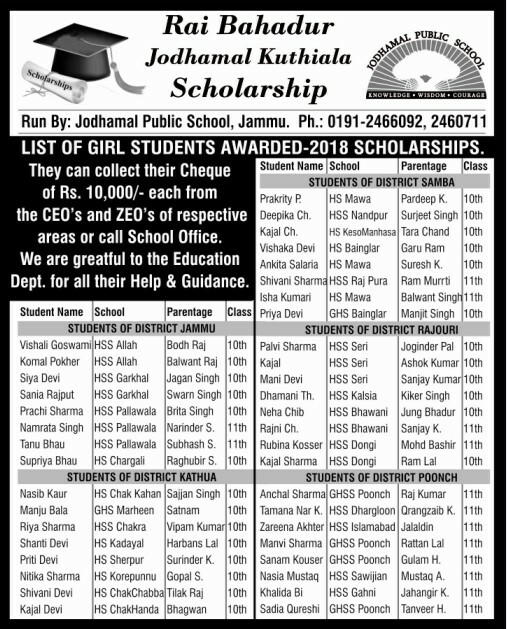 Prof. Amitabh Mattoo appreciated the gesture of giving scholarships to the girls from remote border arears of Jammu province, also remarked at the amazing street plays performed by the students of these three adopted Govt. schools. Trustee of Jodhamal School, Mr. NandanKuthiala thanked the secretary Education, Mr. Farooq Ahmed Shah, IAS, Director Education, Mr. Rakesh Srangal, KAS & Joint Director Edcuation, Mr. Charandeep Singh, KAS for their assistance in formulating the list of scholarship winners from the remote areas of the state. Mr. Trilok Singh Bist, Principal of Jodhamal School welcomed the Guest presenton the occasion and thanked teachers of Jodhamal School who have been going to the adopted schools namely Ms. Samriti Malhotra, Ms. Harmeet Raina, Ms. Bandana Sharma, Ms. Sheena Jamwal, Ms. Chetna Bhat, Ms. AnanditaDey, Ms. SarojSambyal, Ms. Anita Nathoo, Ms. Jaspreet Kour, Ms. Poonam Sarmal& Junior CCA Coordinator, Ms. Sonia Mahajan. The function was compared by MS. NandaniBakshi.